As I write this paragraph, my blog is racing past a milestone that I would have, at one time, thought unreachable: five thousand subscribers. Now before you go getting all impressed – or thinking that I’m trying to impress you – please keep reading. What does it mean to have five thousand followers? To the uninformed, including me just a few months ago, it suggests that a certain number of people are receiving an email notice whenever I publish something. If logic follows closely behind, we might then conclude that most of them would actually be reading the posts. That’s why they subscribed, isn’t it? Because they don’t want to miss a single word! There’s a part of me that would like to believe that. Meanwhile, however, all the other parts conspire to assure me that this is some sort of mistake, a clerical error that has landed at least forty-nine hundred of those poor souls in the wrong place. We’re all busy. We have more things to do every day than we can handle in a week. Who can keep up with the rising tide of blog posts? And the stats bear this out. The number of visitors I get is a tiny fraction of the people who have asked to be notified as soon as there’s something new to view. But clerical errors aside, why would they subscribe if they have no intention of coming back? I’ve asked similar questions over the past couple of years. Why do I get emails that are filled with nonsense phrases – or contain nothing at all? What does a person gain from sending out blank messages? Just as puzzling, what reason could there be for someone to spend the time and mental energy it takes to write and transmit a virus whose sole purpose is to destroy the work of strangers and cause them unknowable inconvenience? What’s the explanation for the epidemic of spammers and scammers out there? But I’ve been paying close attention to the climbing subscription numbers, mostly out of curiosity, and some mild concern. The total jumped by a thousand in less than seven weeks. What have I done to cause this surge in popularity? Nothing. I’m not on Facebook, I don’t Tweet, and I rarely even talk or write about blogging. Yet new followers continue to arrive, currently at the rate of thirty-six a day. Why? Just as there are people who do nothing but comb the latest additions to Freshly Pressed, there are others who apparently subscribe to blogs with the sole intent of receiving grateful feedback on their own sites. I’ve had Likes show up within seconds of my publishing a twelve-hundred-word post. No one can read that fast. Their goal must be to attract attention to themselves. At least that’s the only explanation I’ve managed to find. But what about the subscribers who don’t have a blog or a website? Many don’t even supply a valid email address. They’ve signed up, but there’s no way to identify or contact them. If they have something to gain, it isn’t clear. What are they up to? Again, I’m mystified. But I’ve picked up eleven more followers since the last time I checked. Some of those who do have blogs appear to know little or no English. A few leave me comments in Dutch, Hindi, Mandarin, Farsi, or one of a dozen other languages. Because accurate translation is difficult, I tend to delete those comments. I worry a little that I’ve rebuffed a sincere reader, but I would worry just as much if I let a message stand that was decipherable to others but not to me. And I have to ask: if my post is written in English and it motivated someone enough to comment, why would they choose to do so in another language? I’m the only one who can see a list of my subscribers, and I don’t go looking for them unless their blog is readily accessible. Being on that list, then, doesn’t seem to provide any obvious benefit. And still, they show up, most of them punching the clock and immediately disappearing again. They won’t leave a comment, unless it’s to sneak in a link to something self-serving. The vast majority will never read a word or say anything. They’ll just hover there in limbo, invisible, present only as a small effect on a four-digit number. A number that I have recently begun to consider meaningless. A number that, by the time you read this, will have surpassed fifty-one hundred. The question is, fifty-one hundred whats? Please understand that I’m not talking about every subscriber. I appreciate anyone who takes the time to read these posts, and I love getting comments. In fact, I believe a mutual relationship forms the very foundation of blogging. But there’s something else going on inside the walls. More than likely, it’s just a lot of harmless scampering, as the inevitable schemers pretend that they’re accomplishing something real. In truth, they’re just busy building a pointless illusion. I hope so, anyway. As far as the numbers are concerned, I wanted to let you know that they don’t mean much. For me, if you’re really here, that’s all that counts. And like you… I have no clue what their motive might be??!! I’m a little concerned, Ruth. But like you, I don’t understand enough about these things to know what I’m concerned about. It’s just a vague discomfort, kind of like a scratchy throat that may or may not turn into something worse. Ok, I subscribed and yes I do read your words on most every post. I enjoy your writings and often am too shy to comment. This one touched me personally, as I wonder where do they come from?? I don’t know where they come from, Caroline, but I’m always glad to see familiar faces like yours. Your blog about your move to Croatia is beautifully written and illustrated. I hope it’s okay that I’m including a link here. Let me know if you want me to remove it. And congratulations on your new status. Thank you so much, I am honored to be included. Mostly I just read, sometimes smile, and then move on. But I am real…I think? If you think you’re real, then you are. Descartes said something like that. Or was it Kermit the Frog? I thought if a blogger has so many followers he/she must be writing amazing stuff.I only have a few and they happen to be the ones I know.Thanks for clearing my mind,I would otherwise think no one is interested because of the topics I write about. I think from now onward,I’ll be contented with the few who are genuine.Thanks for your post.It certainly is an eyeopener. Ranu, it seems that there’s a difference between a good writer and a good blogger. A person can be successful at blogging by a skillful use of social media and marketing techniques. That’s what I was trying to say in this post: those numbers don’t necessarily mean anything. Just to say I’m here. And I agree. I have more than 1500 subscribers, and a fraction of those visit. Which blog are you talking about, D? Daily (w)rite has more than 5,200 followers, doesn’t it? I knew you existed, and have the missives to prove it. I’ve had the same thing happening and have wondered about it as well. Starting seeing all these new followers, but no increase in visits to posts, likes and comments. Did exactly what you did – checked their sites – and saw that many were completely blank. Glad to know I’m not the only one. And, for the record, I’m a real follower who does read your posts and enjoy them! Thanks, DSW. I enjoyed your recent post on being directionless. I’m glad you found your way here. Chrissy, I can almost guarantee you that if someone ever does figure this out, it won’t be me. 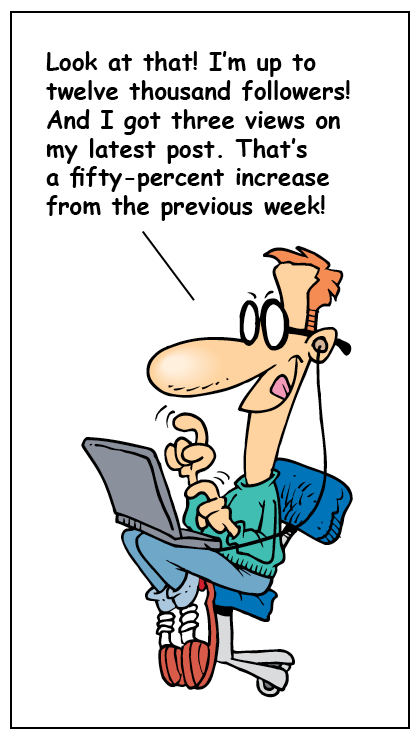 I get the e-mails and I read when I can, I am amazed at the numbers, too…. and I wonder, who clicks who reads, who cares…. I have a much smaller readership than you and I’d like it to be larger, but the folks who read my posts do occasionally comment and I comment back, my biggest stumbling block is that I have limited time – we all do – and I can’t read it all, or sometimes any of it. I like your title, because we all have mostly bright ideas but the key is what we do with them. Keep writing and I’ll keep reading, reflecting, and commenting – when I can or when what is written strikes a chord. Those limits on our time mean that there are just so many blogs we can read and comment on. Once we cross that line, it becomes more about the numbers and less about real connection. Then it isn’t blogging anymore. Thank you for the feedback, Clay. This post really resonated with me and I relate to the perplexity. Most of my subscribers appear to be either non-English speakers or bogus bloggers, or to represent values entirely contrary to those expressed via the content of my posts, i.e. the authors of preachy christian blogs. Where do they come from and why?! I think it must have begun with a sound idea, and then — as so many good things do — it became perverted. I’ve read that one of the best ways to find your audience is to go out there and make connections and create reasons for people to come looking for you. And, of course, provide directions: a link. In an ideal world, it works very well. People find each other, and relationships build. Some fall away and new ones show up, and the whole thing is alive and legitimate. But once a process gets enough attention and produces enough success, others latch onto it, looking for shortcuts and a share of the reward without putting in the effort. It’s inevitable. I can see it happening, even though I can’t profess to understand exactly what I’m seeing. Well, I know that I enjoy your posts so much that I have recommended you to some of my best friends, all of whom say they are now following you. So you can attribute 10 or 15 followers to readers like me. And then I have in fact “liked” your post to Facebook where people I might not have directly told to “read this guy; he’s fantastic” might have actually read you and thought, “Wow, he’s fantastic,” and clicked to follow you. Yeah, yeah, there are the slinking dogs who are “liking” you and then saying, “And check out my blog,” and you know who they are. But I think you have a good, honest following of loyal readers, and they are, like me, recommending you to your friends. I get as excited about getting a new blog from you as I do from getting my monthly The Sun magazine (I mean the intelligent magazine out of Chapel Hill, NC, not the trash news)…. which means all stops until I’ve savored all that you’ve written. Thank you for the kind words, Patricia. It sounds as though you’re doing a better job of promoting my blog than your own. Do you know that there’s no obvious link from your gravitar back to your site? I’d gladly include it here if you want me to. Are you still in Costa Rica, or have you moved to Colombia? A thoughtful and well written piece, Charles. I feel that if even one person reads my blogs, and something I’ve written connects, or resonates with them, then my goal has been achieved. Sorry, kasturika. I didn’t mean to freak you out, and I certainly wasn’t referring to you with anything I said in this post. Your blog is real, and filled with skillful writing and beautiful images. My little blog has had an “alarming” upsurge of “like” spammers and my following has increased dramatically in the last two weeks. I read another blogging friend’s post just yesterday, noting a similar upsurge. She has decided to eliminate her “like” button. It’s interesting that so many people are reporting the same thing, and that whatever is going on, it seems to have started in the last couple of months. I’m sure you’ve already thought of this, Phil, but the ability to build a readership for your blog was one of the tools that could be used to convince an agent or publisher that your books might have an audience, too. But if the numbers are questionable, they lose their value. Thanks for letting me know, scrounger. And leaving a comment is nice sometimes — it takes only a minute, and you can make someone’s day. Hello! I’m a subscriber from Spain, Europe, and although I have no blog nor do I tweet, I subscribed because I love reading your posts and really think they are funny (well most of them). So don’t forget that there are also some “normal”people out there. I remember you, Xenia. But I thought you had a blog at one time. Very thoughtful post. I’m glad now I only have 105 – five of those being friends and family I press-ganged into following when I started my blog. Invite them over for my 21st birthday? I would, but that’s still a couple of years away. Good to hear from you, ET. I’ve also noticed that a few people ‘like’ my posts within seconds of them being published. I think we can thank the WordPress.com reader for that. You can ‘like’ a post from the reader without actually having to navigate to the post. The widget that shows the number of followers – well, you can remove that information if you don’t think it remotely indicates anything, or you don’t want the bragging rights! I sometimes read new posts right from my email, and have left comments within a few minutes. But when it’s literally a few seconds, the Like seems questionable. As for the subscriber widget, I’m thinking of deleting it, because I’m not sure what it indicates. Humm – it’s happening to lots of us then! Just last week I received a notification of my 1,000th subscriber. I hadn’t really noticed it jump from the steady six or seven hundred who’ve been following my blog for several months now, but yes, there it was, on the list – several new subscribers every day, and already this week fifty new subscribers have signed on. I was amazed and gratified, at first, but, being stressed and busy packing up to move country, I didn’t have time to delve into who these new people were, but I did register that likes and comments hadn’t increased as I’d expected with all these new ‘friends’. Anyway, your 4000 odd spurious followers are missing out if they don’t pop in and have a squizz from time to time, even if they don’t have a chat while they’re here. I’ve had the same experience. When subscribers show up at an increasing rate, I would expect to see a proportionate rise in visitors and views, but that hasn’t been happening. I have to conclude, then, that many of those new subscribers are ghosts. I used to feel intimidated by the blogs I follow that have followers numbering in the thousands. Now I think I’ll just be happy that I know most of my followers who follow my blogs because I follow theirs. I also have the bloggers who follow mine and I have no idea why because their blogs don’t interest me at all. I’m wondering if they follow my blogs to try to mine my followers? I don’t know, Ruth. I’m sure many of the people who subscribe are doing so because they like your blog. As for the phantom followers, I’ve probably already given them too much attention. Count me in as one of the similarly confused. I got a response written in what looks to me to be Arabic. When I went to their page, the whole thing was written in this language as well. There’s a lot I don’t know about WordPress, but I haven’t found a translate button anywhere. Also get quite a few who want to help me turn my blog into a million dollar business. All I can say is if the number of likes/followers brings in more true readers, then something good comes of it. Glad you brought this out, though. It seems to be a snowball effect, Rayora. The more subscribers you have, the more the number itself attracts the pretenders, and it just inflates from there. But you’re right: some of those new people will be sincere, and they’re the ones we should be focused on. I’m real but I get your blog sent to my reader so I don’t know if you even know I’m here unless I comment. I don’t know if your system counts the ones that get sent to readers. I’ve been told some people get paid every time someone clicks on something or every link they make or something like that so those people don’t care who they attack because they get paid anyway. I never click on those odd ones because I don’t want them to get paid for bugging me. BTW, I don’t always include a link to my blog when commenting but I will today so you can see I am real if you want to do so. Nothing exciting happening here right now, though. I don’t know how the stats are registered, and I’ve wondered if someone reading a post in their email gets counted. Probably not. But I’m no longer paying attention to the numbers, anyway. Thanks for the comment, Linda. It was good to hear from you. Stay safe out there on the road. Count me in as real and confused too :-). Stacia, I don’t know how many ghost followers you have, but I’m sure that anyone who has read your words and seen your photographs has been converted to loyal subscriber. It’s a mystery to ME, too — when I finished my last journey for Heifer on 12 x 12 on January 1, 2013, I posted that I was finished blogging on that site, but nevertheless I STILL continue to get about 6-10 new subscribers a day. However, like you .. my readership didn’t go up accordingly. I’ve had the same questions about what’s really going on — I mean, why bother subscribing to a blog if you’re not going to read it?? I barely have time to read the blogs I subscribe to — but I do because I feel connected to those folks and want to read what they write. I think WordPress has gotten kind of squirrely — but I guess we’re in it for the fame and fortune, right? Ha!! p.s. One issue may be that when you subscribe, it doesn’t always come through to your email — check your settings and you might see that you’ve inadvertently been shunted to the NO email notification on blogs you’ve actually subscribed to. It’s bizarre and I’ve written to WordPress as to why this happens, but they just wrote back that it doesn’t happen. Unfortunately, it totally does. It must be something like mass emails. I imagine these people subscribe to every blog, or at least every blog with a minimum number of existing followers. But how do they find them? And what’s the motivation? It has to be financial, but I don’t understand who has enough money to pay someone for doing absolutely nothing. Or am I just showing my age again? Dounia, I agree with you that blogging is about making connections, and sharing. I wouldn’t want you to feel obligated to comment, but I also hope you won’t hesitate to do so when you have something you’d like to say. Either way, I appreciate that you would take the time to read my posts. Thank you. I’m not a subscriber. I don’t understand why people subscribe either. I follow you because I’ve read your posts and enjoy reading them. I don’t get why someone would clutter up their email. My email is cluttered enough with nonsense and baby sites i’ve joined, coupons, etc. I check it all day just to keep up with them. Keep up with deleting them that is. And following seems easier. I’d rather just log in to WordPress when I want to read or engage in conversation. Since i’m new to WordPress, I do have to admit I get a bit excited when I get new followers, likes, comments and such! That’s good, because I just left you a comment. Thanks for the kind words. I hope you’ll keep coming back. So true! Which is why I am VERY selective about the blogs I choose to follow, and also comment on. Glad to have developed a sincere and mutual friend and follower in you, Charles. Thank you, Rufina. I feel the same way. Thank you, Sara. You must be very busy with school and wedding plans, so I appreciate that you would take the time. I am glad to hear someone who seems so well established as an experienced writer voice concerns I share as a novice. My comprehension of statistics and “likes” are blurry leaving me to wonder at what, who, and why myself. I can understand people who read and click Like, or just read and don’t do anything. What I can’t fathom is why so many people would bother to subscribe and then disappear. I have to assume that subscribing to blogs is what they do, and that they do it in great numbers; I just don’t know why. I am reassured by your blog. Thanks for writing. I will read when I have the time. I also admit to reading blogs for topics to discuss on my own blog. ( I always include a link to the blog I mention). I will generally only comment and follow when I have the intention to read updates though. I have 13 very valuable followers. I have only been blogging for 2 weeks and set up my twitter account at the same time. I was very surprised and pleased when I got my second and then subsequent followers. The first was my husband, so not sure that technically counts. I do find that I check the stats on Word Press quite obsessively. I hope you continue to attract followers, and that all of them are real people who are looking for genuine connection. Congratulations on the new blog. And, yes, your husband definitely counts. I hope you start with the better half. Charles, we have communicated frequently on our blogs so I know you know I am not a spambot. I often wonder how people accumulate all those followers. I have very few myself, I don’t think I have even hit a 3 digit number. There have been times that that really bothered me but I have to say my interaction with my followers seems to be a high percentage compared to some of the blogs with the big numbers. There are a couple of blogs that I follow that I did so because they were really well written and interesting. Within a couple of months they had the big numbers and became all about the numbers. Now they put stuff out there either for sponsorship or contests or trips etc. all touting how many people they reach because of their big numbers. Their writing has really suffered and I have lost interest. I don’t even know if I unsubscribed or just stopped the emails. Anyway, you are stuck with me Charles, as long as you keep writing the way you do, I will continue to read. Of course, I really enjoy our little “conversations” as well. I think humans are drawn to crowds. If we see a bunch of people looking at something on the sidewalk, we go over to see what’s going on. As the group gets bigger, it becomes more intriguing to anyone passing by, and then it snowballs. That seems to be what happens with subscribers to a blog. As I said, if that’s all it is, then it’s lost all meaning. I much prefer real communication to inflated numbers. Thanks for sticking with me, Michelle. I’m lucky that way. I began reading your blog when you were Freshly Pressed. I’m now a regular reader. I know you’re in NY, but I still swear that you were living in Detroit when I was a kid. That’s why I enjoy your blog so much…your experiences as a child are just like mine. I don’t Twitter or Facebook, but I wouldn’t be surprised if the latter wasn’t the source of a lot of your thousands of followers. It was only a matter of time. Somewhere, somehow, some geek made it so that blogs and facebook can interbreed. I have problems with Italian and Chinese spammers. Because I don’t know any Italians or Chinese outside of this country, and I don’t read, write or speak Italian or Chinese, I just set my filters to ‘stun’ and the junk goes directly to the trash. I wish the spammers would leave you alone. But then, I wish they would leave everyone alone. Can I be an honorary Detroiter? Do you WANT to be? Goodness, I’ve not been to Detroit in forty years. You’re far better off being a New Yorker! I’ve never been to Detroit. I guess I’ll have to visit some time and then let you know. Ditto here…..to all responses thus far. Thanks, CW. I need to visit your blog. See you over there. I was also scratching my head about my sudden surge in followers lately. I think about 99% are robots or cats or robot cats. I have to laugh because I also get people who seem to have this incredible ability to read my 1,000 words posts in two seconds and click that ‘like’ button at lightning speed. If I could read that fast, I’d subscribe to more blogs. Numbers are pretty meaningless. A year ago I was hovering at around 300 followers. I was beyond ecstatic to have ANY readers. Since the beginning, I’ve had a great small group of readers and commenters. Today I have many more followers and nothing’s changed — I get the same amount of ‘hits’ on a post as I did in the beginning. And I still appreciate my loyal commenters. Those real connections are all I care about in the end. So we’re in the same boat, Darla. That’s reassuring. Although I don’t remember getting into a boat. Do you? Wowee you’re at 5,000? that’s amazing! I will say congratulations Charles because when I started following you there were only a few dozen of us in the club! I’ve also noticed a surge in new followers most of whom don’t have blogs – just an email address – and the wondering rose in me wondered what’s going on here… ??? I just posted an 800 word post and got 3 likes within two minutes!!! I think it’s mostly those same few dozen who are really still here, Rosie. I’m glad you’re one of them. I heard that “Google Analytics” will analyze the hits of your posts. So if you figure out how to use it, please tell me; I’d like to know too. Okay, I just set up a Google Analytics account and received a tracking code. I have no idea what to do with it. There are instructions, but I don’t understand them. Maybe you can figure out the next step. This might mean a wait for my neighbor’s son to come home for another visit. He’s the one who told me about it. Should we start a petition to him urging him to come home for Mother’s Day? I’m afraid it’s just going to tell me what I already know. You’re quite right, Charles. There’s a lot of people out there, and they have a lot of projects going, some of which relate to your blog only in the most incidental way. And unfortunately, some of the people who do read our blogs, don’t understand us the way we wanted to be understood. This whole emphasis on statistics seems to be the project of wordpress, trying to hype things up when they can. I’m satisfied to hear from my readers now and then, but don’t give much credence to numbers, especially when there’s no reflection in the other aspects of blogging. Always enjoy finding a new and interesting blog, and very glad I found yours. Somehow, underneath it all, things always come down to numbers: How many visitors? How many views? How much can we charge for advertising? I’m glad we found each other, too, Shimon. Thank you. What ‘concerns’ me is that the only recommendation being given is to report each and every one of them (that could take you weeks, Charles) but there’s no method available to us for removing the ‘spam’ followers from our list (wouldn’t an ‘approve’ follower option be nice?!?!?). The most curious part of all this is that no one seems to know WHY they do it – there’s no obvious benefit (even if you click through to ‘check out’ their blog, they get nothing but an additional ‘view’). I suppose it’s just another one of those Internet ‘curiosities’ that we’re going to have to learn to live with (what’s most annoying is the fact that it makes our Stats totally unreliable). Exactly, Margo. I used to feel some satisfaction in the increasing numbers, because I thought it meant that I was learning how to find my audience. It turns out, at least in part, that I am the audience. I just don’t understand which show I’m watching, or why. I started reading your blog because I started my own here on wordpress. Have to admit I am not at all familiar with the world of blogs, since I am myself an old newspaper journalist with little or no understanding of the many powers that are currently taking the very bread from my very table… Stumbling upon your blog, I found a person, a twin soul if you may, sharing my vision of how language should be used. Rather than writing quick and somewhat accurately, I find myself now trying a little harder to weigh words and phrases when I write and this is largely thanks to you. It’s not easy for a person with more than 40 years of writing for a living to come back to the concept of living for writing. Mind you, i got 40 clicks only yesterday! 🙂 Three of which were registered from Canada… GO CANADA! Thank you for the thoughtful comment and the kind words, Anders. I wish I could read Swedish, because I have a feeling I would enjoy many of your resting thoughts. Good luck with your blog. I don’t have a blog (I know, you keep telling me to start one) so I don’t get how it all works. I am a subscriber and I absolutely read every single one, but only comment 25% of the time. I don’t know what category that puts me in, but I don’t really care about categories, so I really have no point here!! As far as the thousands who sign up but probably don’t read – there are many people who like bragging about how many Facebook friends they have or how many blogs they subscribe to. Maybe it makes them feel less alone in the world or something. Or they feel that the bloggers have a bit of celebrity status and they want to be a part of that. Just keep writing, knowing that there are plenty out there who appreciate whatever you have to say, even it they don’t comment. Or they’re just laughing at you. Whatever…. Actually, you’re in a category all your own. But you already knew that. We should talk soon; it’s been about a hundred years. I’m not a subscriber, but after reading one of your interesting articles, I clicked follow and read you in the Reader, I’m fairly new to blogging. I’ve made a few subscriptions, and it’s a hard slog to read them. I found this article interesting and informative. I’ve heard about the spamming or phisching problem on another blog I follow dedicated to photography…and evenI have recieved an obvious spammy comment to one of my poems….I’m thinking that the more you press the more some people are attracted to your blog. Worrisome. It is worrisome. I know people who have changed the names of their blogs, made them private, or stopped blogging entirely, all because of stalkers, or unwanted attention of some kind. Just another example — and in the scheme of things, not such a big deal — of a few ruining things for the many. I am one of those who reads but rarely comments. Sometimes things I find interesting are well outside my prevue, so I tend to learn but don’t feel I have anything else to add to the conversation that might be happening! I on the other hand am one of those nut cases who reads everything you write – because I enjoy it — and more often than not feels compelled to blather about something or other. I do completely agree with you that by and large, huge numbers are not as impressive as some would like us to believe, especially followers & friends. So many people get into “I’ll do you if you do me” mentality just to rack up huge numbers that in the end they don’t care about or interact with 99.9% of the people on their list. Allan, I’ve seen blogs that are just a few months old and already have thousands of followers. I think some people are better at self-promotion, or have access to a large prospective audience. But as you said, it’s really about the interaction. By the way, I don’t seem to be getting notices about your new posts anymore, so I have to go looking for them. That may have something to do with a drop in the number of visitors. Hmmm… I’ll have to lift the hood and look into that. I have gone to a weekly digest e-mail notice (goes out Sunday mornings) Maybe I should go back to pestering folks with an e-mail every time one goes live. Most weeks, that’s just once anyway. Since I usually leave lengthy comments on the subject of your post, I’m guessing there is no question as to ‘what’ my status is. But you are absolutely right, I’ve gotten tighter with the spam parameters. I’d rather have fewer genuine followers who engage in the topic, than a million I never get to know. It seems to waste everyone’s time, Renee, with no discernible benefit for anyone. But I always welcome your comments, of any length. I don’t know if it would help, but you could try closing your blog to search engines – or try it for a bit. It depends on your reason for blogging. If it’s to get more people to (ultimately) see your books, then that won’t be good for you. But if it’s just to entertain, then you might do well sticking to the readers you already have who are the real people! I hope it all starts getting better soon. It makes a mockery of the Follow count (not that it means much anyway as that is just people with wordpress.com blogs who are reading you via the onsite Reader and/or email notifications. You’ll have many, many more people who enjoy your blog via external feed readers, their bookmarks, shares people have done on Facebook and Twitter and various other site, and so on. You seem to understand this stuff much better than I do, Val. But I finally realize that the number of followers is a useless stat, so I’ve stopped paying any attention to it. Charlotte, please don’t hesitate to comment. And thank you for sharing my blog with friends. That means a lot. Don’t wish for it, Rachael. Have you ever walked into a swarm of gnats? It feels something like that. I will try to be content with my few. I don’t blog or tweet or even own a cellphone. The only reason I even have a laptop is because I used my airmiles to get one so I wouldn’t have to sit in the basement on the desktop computer. My son was teaching English in Korea and reading his blog made me not miss him as much. He was freshly pressed on wordpress which is how I found your blog. It just caught my eye one day and now I follow his blog (even though he is now home and blogging from his room) and your blog which I do comment on once in a while….so even though I am technically challenged I am real. How long was your son in Korea, and did he like it? My son-in-law’s brother has been there for about ten years, teaching English. Thank you for taking the time to read these posts, Sue. And I appreciate the feedback, whenever you feel like commenting. My son was in Korea for two years, then spent 4 months travelling to Vietnam, Cambodia and India. He came home this past December but although he has five years of University and a teaching degree the job market in Toronto for teachers is terrible so he has re-applied to go back to Korea for another year or two. I will continue to read your blog as you bring back lots of memories and make me laugh. Sorry to hear about the job market in Toronto, but teaching positions are scarce all across Canada. My daughter and her husband ended up teaching in Beijing for a year for just that reason. They also went to Vietnam and Cambodia for vacation, an idea that still sounds a little strange when I say it. Please wish your son luck for me. Hi Charles (if I may be so familiar…). You raise some interesting questions. I’ve noticed there isn’t often a correlation between a popular blog and an interesting or well written blog. At least not as much as I would expect. It does seem like the blogging world can be more about attracting readers than about content. The system seems to encourage our tendencies to check our stats and compare ourselves to others. This seems a bit sleazy to me and I decided a while back that I wasn’t going to write a blog, comment on blogs, or reply to comments in order to build my readership. It has to feel real, authentic. I aim for real connections or none. But this is likely just a reflection of my introverted nature. An extrovert would want something entirely different! In any case, there is room for us all. I haven’t been hit by the mysterious disappearing followers, and I don’t want to. Tandi, I guess blogging isn’t that different from other media. There are movies and books I think are terrible, yet many go on to be blockbusters and highly profitable. Marketing is a powerful thing. You are right. It seems to transcend intelligent thinking sometimes, which is the part that surprises me. Good post! While I’m pretty sure I’m impressed by your numbers, I like your humble and slightly sceptical view of their meaning. Personally I have given up really trying to understand the stats page because it just confuses me! Although, I’m sure you should be flattered that spammers think you are so important and need to keep trying to get seen on your blog. If weren’t getting a good amount of ‘real’ readers I’m sure they wouldn’t bother! Thanks for the thought, KL, but I still don’t understand how they know how many real readers I have. If they knew that most of the people they’re reaching out to were spammers themselves, would that make a difference? Maybe as the process continues, and more and more spammers accumulate more and more connections, the value of whatever it is they’re seeking will drop — like the blogging version of a stock market crash. Indeed! I wonder whether spammers care once they’ve caused such a crash? Do they just shrug and move on, leaving the blog they infiltrated feeling empty and alone? Yeah… probably. Lucky you’ll be able to see who your real ‘friends’ are after the crash! I follow, read, and enjoy. Thank you. I liked your most recent post, too. I see why people follow you right away. Your writing is clear and you have an opinion. I forgot myself while I wrote. It’s a knee jerk reaction to not let this get away by. Follow means you will be in my reader when you post again. Even if I don’t have a comment, I enjoy being smoothly painted on the page. Sometimes, I can’t read everything, but when my fav writers post and I’m in a rush or thirsty for another subject now, I like. Thanks for posting that. I know it’s good cuz you are good to me. But I am into poems right now. Get you later. Just know I like you. I’m glad you’re here, and I appreciate the comment. I hope you’ll be back. Your blog has many more subscribers than it did the last time I was there. Have you been noticing the same trend? I’m really here Charles. I am not a blogger, just a reader and hobby fiction writer. You are my only blog subscription because I don’t have time for more. I also have your book “Who Knew? My reluctant journey to blogging addiction.” I relate to your words, you make me laugh, you make me remember, you make me think. I usually don’t comment because the last time I did (was a long time ago) I noticed you responding to each comment, and I thought what a nightmare that must be for you. So I just read and nod. Thank you, Lyndi, but be assured that comments are not a nightmare. It helps to know when someone can relate to what I’ve written. It’s also good to hear the opinions of people who may disagree, or who have had experiences that are different from mine. Charles, I love how you make the effort to read other people’s blogs and to read everyone’s comments to yours. You’re one of the few bloggers who take the time to do that. And I’m also glad someone finally addressed this issue of subscribers who lurk about, or ones with no websites, just a gravatar. I’ve been noticing a huge spike in subscribers recently too and was very flattered…till I ventured to look at the subscribers more closely and discovered they were all spam – or websites in Italian, or pig latin. Or, websites selling support hose, or ones which read, “this is a website, this is a website of website, no doze jesus christ ignatius wang chung teeny weeny bikini of the holy grail”, etc. Susan, I wasn’t aware of how widespread the problem was until I started getting all these confirming responses to this post. Since then, I’ve found many discussions about it on the WordPress forums. Your blog is filled with great writing and humor, and deserves many more readers. I’m not surprised that it’s also attracting a lot of ghost followers. I’ve had a handful of faux commentators. I just think that’s par for the internet course. Just imagine though if all of them were genuine. Could you keep up the return visits? I haven’t a tenth of the followers that you have, Charles, but even for me it takes time to visit in my turn, to read and to comment. I have set up a wordpress visits section in my favourites and drop in now and again to see what people are up to. People who visit regularly are friends now, so I visit them more often. Span subscribers aside, Charles, I am not amazed given the consistent quality of your work — you have managed a great deal of genuine followers despite not having a facebook or twitter account. Well done. Mary, would you send me an email one of these days and explain a little more about the WordPress visits section? I don’t even know what that is, but it sounds like something I should be doing, too. And thanks, as always, for the kind words. The spikes are interesting, aren’t they? It’s as though these people had a meeting and all agreed on which day they were going to follow you. Not that I’m paranoid or anything. Although I hear the music, too. I wish I had the time to read all of these comments right now. I’m (truly) interested to know in what manner this seems to have resonated with so many. As for me, thank you for saving me the effort of finishing one of many partially written posts. Yours are always more articulate anyway. Thanks, Hippie. This has hit a nerve of some kind. I gave up looking at the stats a long time ago and I also quit receiving notices when someone liked my post. I used to click on those likes but started to find that the majority were blank or were blogs with no posts yet on them. As far as following someone’s blog, I’ll do that most often if they comment with some substance on my post, not because they “liked” my post. But now think about this: Even the most famous and successful bloggers have far, far more fake likes and followers than you and I do – so their stats are enormously inflated. All I can say is that I sure am glad I met your acquaintance, Charles. You are my favorite blogger. That’s a stat you can put in your pocket. Your kind words are better than any stat, Jean. Thank you. I think following their link is one objective, Diane. But sometimes there’s nothing to follow. Another blogger suggested there may be a reward of some kind for subscribing to a certain number of blogs. That seems both mysterious and possible. Funny, I was talking about this with my wife last week and she told me to focus on the writing, not who’s possibly reading but I always wonder where they find me? I saw this link in freshly pressed and thought I’d drop a note. This post wasn’t Freshly Pressed, but you’re at least the third person to say that. More stuff to wonder about. Random? Maybe it was one of the ones that came up as suggested then… Either way, glad I saw it. How exciting. 5000 is a huge number. Congratulations and thanks for sharing your milestone with us. It’s a big number, but I still don’t know what it means. Thanks for the comment, Kendall. I appreciate your feedback. I’m glad you wrote about this, it relates to many of us. In a way, it might be a good thing, this current mockery that is being made of stats due to the invasion of spammers. Perhaps once we quit wanting to quantify our work and our relationship to other bloggers, both of the former will have a chance at not only surviving, but thriving. I don’t know. Just a thought. I am always happy to have at least one or two other serious writers to follow and who follow my work. You, of course, hold a special place in my heart as a blogger because you’re the only person who read my work and commented on it with care. And this was after I’d been blogging for at least 5 months or so. That one person actually read what I had to say and took the time inspired me to keep writing. You are a bright light in the darkness…it makes sense much life would be attracted to you. I guess even spammers are some kind of life form. I don’t remember exactly when I found your blog, but I’m pretty sure you already had some loyal readers. And even if you didn’t, it was inevitable. Your thoughts are insightful and original, and your writing skills are excellent. At the same time, you’re kind and encouraging to other writers, as you have been to me. Thank you for that. And here I thought I’d finally made it to the big time — between the 200 new followers in the last week and the offers of money for blog posts. Guess I have to go to work tomorrow after all. Darn. I’m going to be retiring soon, Elyse. I got an email yesterday that said I’d be receiving twelve million dollars from a Nigerian bank account. Now I can start buying name-brand toothpaste again. In all seriousness, I’m a very “lazy” blog owner in that I get new people subscribing to my blog (I too have noticed a very modest uptick recently) but I do not reach out to new subscribers typically. I figure if they want to subscribe, they’ll read. If they don’t, they don’t. Eh, I only have a few hundred subscribers, but my regular reader base comments often and I know who they are and I always respond to their comments on my blog. Every once in a while I’ll check out someone new who has “liked” a post, and exactly as you’ve said, it’s usually people who have a lot of “thanks for stopping by and liking my posts and subscribing to my blog” comments on their About pages. They’re trying to bootstrap their own blogs, which is fine, but that doesn’t motivate me to “follow back.” Great content does. You would have no way to know this Charles, but you’re one of very few blogs I’ve subscribed to; I found you based on your Freshly Pressed entry a while ago (back in the days when I checked Freshly Pressed, which I don’t anymore…). I keep reading because I enjoy the content and your consistent post quality. Maybe worrying about the fake subscribers isn’t worth the time it would take. Just keep doing what you’re doing. I guess….you too, cause its working! Perhaps it’s like having thousands of imaginary friends. You can call them your spamily. I’m just glad I’m not one of them. I love your work. Thanks, fellow Bronx-born person. I’m glad you’re not one of them, too. I see Val mentioned the discussions on the WP forums. I just went there today to rant and rave about spam followers, and found this discussion thread. It’s worth a read-through. I’ve already stopped my “like” emails and turned off likes. One problem is that even when we turn off likes on our posts, they’re still functional in the reader. I don’t have a clue where the crazy spam follows are coming from, but I’d suspect bots. I can pinpoint when they began almost to the day, and they’re getting worse. I was using my followers as a way to gauge blog growth. No way to do that now. One suggestion that is getting some play is allowing us to block followers, much as Twitter users can. It would be worth the time to be able to do that. We’ll see. Linda, I just took a look at that thread. It’s interesting that the WordPress experts don’t know the motive behind all the fake followers, yet as you say, the numbers began to soar quite suddenly. That suggests that either thousands of people all over the world got this strange idea at the same time, or a handful of them figured out how to make it appear as though these were real subscribers — and somehow benefit themselves in the process. I’m not on Facebook or Twitter, so I don’t know how there could be a connection there. Then again, I often get phony emails that look like they’re coming from members of my family, but a quick glance at the first line (or the pictures) tells me they’re not. I don’t know how or why this is happening, but you’re right: the stats are pretty much useless now. I’m sure some of your new followers are showing up because of your content. Your blog is one of the best I’ve ever found. I was going to include a link, but thought better of it. For anyone who’s interested in excellent writing, The Task at Hand is in my blogroll, and has been almost from the beginning. Thanks, Jiawei. It’s always good to see you, and get your feedback. Right. Well. If they’re looking to build community, it would be helpful if they would communicate in a language I understand. I have one answer to “if my post is written in English and it motivated someone enough to comment, why would they choose to do so in another language?” A subscriber to my nature photography blog is French, and she has a similar blog of her own in French. Occasionally people have left comments in English on her blog, and from her answers in English I can see that she doesn’t seem to know English well enough to express herself well. When she comments on my blog, she writes in French because she knows that I understand French, and that way she can express herself naturally. I’m guessing that at least some of the foreign-language comments you get are from people in a similar situation: they may know enough English to be able to read what you write, but not enough to feel confident writing back in English. I’ll grant that that explanation is more plausible on a photography blog than on yours, which consists primarily of English text. Of course. But I wasn’t talking about comments. I was responding to Charles’ original point about spam followers, which I assumed C. Burdett also was responding to. I’ve been overrun by followers who never come to my blog, and leave no comments. When I attempt to figure out who they are by going to their blog, it’s impossible for me to know anything about them because their blog is in a language I can’t even identify. Often, there isn’t even a blog or an email address – only a gravatar profile in a foreign language with no links at all. I’ve never received a foreign language comment, but if I did I would do my best to interpret it and respond as fully as I could, with apologies for my own lack. Google translate makes at least that kind of minimal response possible. I’ve been puzzled by the same things you mentioned. I don’t usually read the forums on WordPress, but I imagine these topics must have come up, and perhaps the people who run WordPress have explained those puzzling things. When I clicked on C. Burdett’s name, I got a message saying that my browser couldn’t find the server. When I clicked on the gravatar, I got a big blue and white letter G, lying on its back with the word false under it. This could very well be a real person offering a sincere response, but those things give me the same feeling I get when my doorbell rings and there’s nobody there. It’s a little creepy. C. Burdett’s comment resembles some of the spam my blog regularly receives. When I clicked his name and avatar I got the same results you did. Let’s hope those clicks haven’t enlisted our computers in some nefarious scheme. Steve, my doorbell just rang and there was nobody there. I think it was my computer. I’m a true reader! I’m a true reader! Stacie, your is another blog that deserves many more readers. The writing is always intelligent and honest, and often funny at the same time. It’s one of my favorites, and I never miss a post. I have enjoyed reading your blog for some time. Some of your posts make me laugh out loud and some posts resonate deeply. I don’t comment often but I do enjoy reading every post. Thanks, Anna Marie. Feel free to comment anytime. i only like what i read and liked, and subscribe to people who are interesting or talk about things that interest me, i give to the community by reading sharing and liking and expecting that it would lead to more people finding out about my blog and reading it….its not selfish its …Communal. and its true what you say though, when ever someone likes one of my posts or follows me i find my self wondering why, did he like the article?what did they think?what didnt they leave a comment? so i check their blogs out to see what they blog about and LO another fake account, just like the ones littering every other social media.. i dont understand it, but i understand that there are alot of idiots that fall to email scams that u knew about 15 years ago, and thats what encourages these scammer spammers to persist in what they do ! What you’re doing is exactly what I’ve been doing. I visit other blogs and try to leave comments that are meaningful. That’s the only way to do it that’s mutually beneficial. Blogging works best when it’s a two-way connection. But the problem is what you called the littering of the social media — people looking to get something by being dishonest and sneaky. Unfortunately, they’ll keep doing it as long as there’s a payoff. I’m probably the only blogger I know who is not a fan of ‘following’. I choose not to follow a single one. I read a couple of dozen wonderful blogs regularly, all of whom I adore in different ways but I like the element of surprise. I like to pop in when the mood strikes me, see what’s been posted, comment if I can add something to the conversation, or just read, enjoy and tiptoe out of the room quietly. I like your approach, EOS. Less pressure. I hope you’re having a great trip. Thanks for the comment, and for being so patient. I’m glad you found my blog, and I appreciate the feedback. So what did you have for tea? I started to notice this phenomenon last year, during the time that I was barely blogging. Couldn’t understand why there were all these new subscribers when I wasn’t writing much. I asked my blogging friends about it and they were running into it too. Ah well. A number is just an objective value until we assign another meaning to it. Like women’s dress sizes. The meaning has been quickly and neatly extracted from many blog-related stats, JM. I don’t even look anymore. Thank you for this, Charles–I feel better. In a previous conversation, you told me that you had realized that “being a professional blogger and being a professional writer aren’t necessarily the same thing,” and now you have helped me to better understand the meaning behind those words. I may not be the most successful blogger (if the numbers are any sort of indicator), but perhaps I’m on my way to becoming a more successful writer–and that’s what really matters. I agree, Karen. I think a person can become a successful blogger through skillful self-promotion. Most writers I know seem to lack that skill, so it’s easy to see how a well-known blogger could be weak in the writing department, while a strong writer could remain all but hidden from view. I would certainly consider you an accomplished writer, and I hope more people will somehow discover your blog. Well said Sir Charles. Just as you have written here, I too believe that at the end of the day it’s the mutual relationships we are forming through blogging without even knowing each other in the real world, which counts the most. Honestly speaking, when I started blogging these number games and stats of blogging used to matter a lot to me just like those so called blogging awards a blogger passes to another 10-15 bloggers. But after more than one year of blogging I have started realizing that, these stuffs hardly matter. Among those fifty-sixty bloggers who have passed on some two hundred blog awards to my blog; now I see few of them do not even bother to pay a visit to my blog, just because I did not dedicate a post to mention their blogs and those awards in my own blog. I am not sure which way of blogging is a constructive one and which way is a destructive one. If I should concentrate on creating stuffs that would make me proud someday or should I try to increase my number of readers by following all those steps a blogger needs to follow. But now I prefer to take only a couple of parts seriously ignoring most of the thing blogging brings with it which are – my writing and reading from wonderful writers like you and try to learn as much as I can. And I believe it will work for me in the long run. I understand what you’re saying, Arindam. I think the answer is to write what interests you and what you think will interest others, and do it as well as you can. Eventually, you and your audience will find each other. I’m pretty sure that’s already begun to happen for you. I don’t need to subscribe or follow – you turn up on several counts on the new lists on the right of the reader – this blog is followed by bloggers you follow – but I used to find you from ‘comments I have made’. One of these days, with time to spare I’ll hit your archives. I’m still not familiar with readers or feeds, but I hope to figure them out one of these days. Meanwhile, thank you for being here, and for your comment. Well, based on how long I had to scroll to get to the comment field, I’d say you’ve corralled a decent share of real readers. Frankly, it would take me all week to just respond to that many comments! Holy cow, you’re doin’ something right, Charles. Thanks, Linda. It is taking me a whole week. I still think the real readers are a relatively small fraction of the inflated total, but I’m grateful for every one of them — including you. I had no idea WordPress was automatically adding Facebook friends to blogs’ subscriber lists until shoreacres mentioned it above. I’m as confused as you are — what reason is there to think your connections from one site are going to be interested in what you’re doing on another site? The choice to become a subscriber is a conscious one, or so we all thought. To be included unknowingly isn’t a choice at all. Sometimes I see a wave of popularity (as in 3-5 views) in another country when I glance at my stats, and I momentarily allow myself to ride a giddy wave of celebrity, thinking that perhaps if David Hasselhoff could fly mostly under the radar here but be wildly popular in Germany, then perhaps I too am destined for fame in another land. Then, I check my spam comments and am brought back to reality 🙂 I pity my poor followers; my blog has such an ecclectic bent that it’s hard for my special interest people to stay engaged. Have you thought about having two blogs — one for special interest and one for eclectic? It sounds like more work, but it might actually be less stressful. I’m so glad you wrote about this and I’m not crazy! My subscribers go up by the day, but honestly, I’ve barely noticed any difference in stats since I had the blog only available to my Facebook friends. I’ve been Freshly Pressed twice, and honestly, it has made 0% difference in how many people read my posts. The people who comment now are the people who commented before. Freshly Pressed has its own set of phantom visitors. There are people who do nothing but comment on FP posts, and then never return. No, you’re not crazy. Making connections was the unexpected bonus I got when I decided to make use of WP to document my life and thoughts. But I doubt that I’d ever get used to certain blogging practices for alliances – as I put in the same devotion and loyalty in my friendships here as I do in my tangible realm. Similar to your ending line above: when you’ve been to my blog and really read my post, it’s all that counts. Because side by side with the joy I get from reading and writing, you remain as the best thing that happened to me in our blogging world. Okay, okay..so my very last line just above you know quite well I also say to all my other dear male bloggers. I was late for April Fool’s Day ;-). Everybody will agree, though, it’s good to have you around at WordPress, Bb. Thank you, my friend from Manila. I can always count on you to say something encouraging. I hope I do the same for you. I’m glad we’re friends, and blogging buddies. I don’t know…Perhaps I was wrong in thinking genuine friendships in our blogland could really exist, Bb. You see, I have a sad story to tell: I was at a very very low point in my life early this year when a blogger friend mysteriously went surly and unforgiving for almost no reason. I was made to think I did something horrid (even when I couldn’t find a cogent ground to merit the severe treatment I received). Until I found out the blogger friend had connected with the flirty freshly-divorced female commenter from my blog. So shocking and unexpected. Maybe not for them. But in my country, it is considered so. I wish I could narrate this in a lovelier manner, but I couldn’t. I wasn’t made of steel not to get hurt. I wish, too, blogger friend helped clear the air, once and for all, instead of dismissing it as if it was a most normal blogger deed – i.e., abandoning one ship to jump into another- to end the resentments and put it behind us. I believe connections and fellowships necessitate consideration of other people’s feelings, no matter how much we convinced ourselves it’s below us and try to defy it. I’m actually pleased with your reply to me up here. And no, I really haven’t said that last line to any other blogpal. You are still the blogger I cherish the most in this blogging world. Hi Charles. It was Michelle (Silk Purse) who asked me to read your blog and I am truly happy that she did. I like your writing, style, content and comments. Obviously there will be some spam following you but a good blog must ultimately attract real followers. Eventually the snowball effect comes into play. I, however, am from the “old school” where I learned that “word of mouth” is the best kind of advertising. I was pretty much sold on your blog before I read it, loved it when I did, and will follow it as long as you’re doing it. Furthermore, I look forward to your replies to my comments – I get a little thrill, like receiving a message from Bill Clinton might do. Any who, you’d might as well come up with a way to make some money from the blog, because it seems sure that some of the 5,000 will try try to make it on your back. I appreciate the consistent support I get from you and Michelle. And I agree with you about word-of-mouth advertising and the snowball effect. It’s just that it can work both ways. If you get enough people looking at something on the sidewalk, that’s going to attract others who will wonder what’s going on. Eventually, you’ll have a crowd, which will draw in even more people — even if there was nothing to see in the first place. As several commenters have said, I’d rather have ten real readers than a hundred pretenders. Oh, and Bill Clinton asked me to say hello. 🙂 Agree with rangewriter. Not you, no. I’m glad, because if you ever agreed with me, I’d probably fall over and hit my head on something. This is not a real person writing this comment. I am not even a subscriber. And I hate spam, tho my grandma used to make us eat it, fried, on toast. What the? I do like most of your posts, and would like to think that I sort of “knew you when” you maybe only had, like, 150 subscribers. I’m sure you are being overly modest on the “aw, shucks, how could *I* get all these people to like me?” part, but I’ve decided not to bang that drum. You’re a good writer. You have made a name for yourself, rightfully so. Your writing rings chords in most of us, and that’s why we come back. Or maybe it’s the spam. I’m not being overly modest. If the number of subscribers continues to increase — over the past two months, it’s been averaging twenty-four a day — then the number of visitors and views should go up at some proportional rate. But it hasn’t. That tells me that the subscribers are mostly an illusion. Thanks for being nice. I know who you are, but I still think you’re nice. I always learn something new on your blog, Tammy. Thank you for that, and for the nice comment, too. Two things. 1) I only read a few blogs and yours is one of them because as Julia above (and I’m sure many others – I only read her comment) mentioned, you are a great writer. 2) My son has to do a project on sub-cultures for an anthropology class. I immediately thought of the blogging community – this post might be the perfect post for him to read as an introduction to the blogging world. However, one really has to be a part of it (the blogging community) for awhile to understand how things work in this part of cyberspace. I feel (maybe hope), that ultimately, there is some depth to the relationships I have made via my blog even though 99% were more like what you described in this post. I say were because I rarely post anymore – I think my blog was a natural way for me to move through a transitional phase of my life. I didn’t realize when I started it, I would be making friends. I guess there are parallels, WW. Your comment made me think about how many people I’ve encountered in my life — and how few of them become friends, or even acquaintances. Maybe the small percentage of real readers is not so unexpected, after all. Have you decided to stop blogging for good? As a day-old blogger, yours is the first post I stumbled upon (a suggestion from something called “Freshly Pressed?” – Newbie Alert!). Very drawn to your writing and appreciate your persepective. Without real connection, the stats on the dashboard report are just numbers that don’t mean much. It’s true that the stats don’t mean much, but I shouldn’t have said they’re meaningless. They’re just somewhat exaggerated. I look forward to reading more of your blog, too, Shannon. Thanks. P.S.I am grateful for the honesty of this post. I had given up, basically walked away (with the exception of reading) . . . but your post inspired me to revisit what I had given up on. Thank you. Good. I’m glad to hear that. Email me if you’d like to talk about it more. Nice way to put things. Loved it! Still reading your blogs. Every one. Still enjoying them too. Thanks, Allyson. And you still have me wishing I could read German. The irony is, I’ve had this email in my inbox as “unread” since you published. But I’ve been too distracted to read it. How funny that that was the subject discussed. I do read your blogs and enjoy them! Glad I finally found the time to read it. Thanks for reminding us why we’re all here in the blogosphere. And it’s only taken me another five days to reply to your comment. Thanks for the kind words, Sandra. Your posts are always such a great pleasure to read Charles! I pressed “like” but it took me so long to scroll all the way down here to comment! I have given up trying to work out the blogging numbers, some of which remind me of those Facebook party invites which go viral but as long as they don’t steal your posts or burn your blog down I hope it is more of an irritation than anything sinister. But what do they get out of it? I don’t know what they get out of it, Patti, and apparently WordPress doesn’t know either. But something is going on — I can’t remember the last time I got so many comments on a post. You know that I’m here, Charles, and that I really do read every word. It may take me a few days to get here after you’ve posted your latest missive, and I may not always comment, but you know (I hope!) that you have my deepest respect and admiration as both a writer and a friend. Therefore, I wouldn’t miss a post! Thank you, Sarah. The feelings are all mutual. Here I am … the 100 and umptiest reader of your blog post … you probably won’t even read my entry … let alone visit my blog posts … but I’m here to tell you, that I have you in my heart … so there … Love, cat. What do you mean I won’t visit your blog? I was just there, and left a comment on the wine glass poem. I can never tell if it went through, though. Good Question! I hear you. I find sadly that people are all about trying to get follows and likes but don’t really spend too much time actually reading. They have the expectation that people will like and follow them too out of obligation or something but hey….I like good content, funny content and that’s why I only post comments on those that I find worthy. While I would love to have tons of followers, it really isn’t that for me..or do I just say that to myself to make myself feel better? hmmmm. That’s another good question. You’re right, Mz: There are a lot of people out there who are just looking to trade likes and links. I don’t understand what the benefit is, but it sounds boring. My pleasure. Have a great week Bronxboy. I’ll definitely let you know, Austin. But don’t hold your breath. The world becomes more mysterious every day. I’m glad you’re back, Sophie, and I hope everything is okay. Agreed, as usual. A friend of mine (who has a pair of WordPress blogs) and I were just talking about this recently, that people will “like” a post seconds after its posted and that…well, that just doesn’t make sense. The thing I still get stuck on is that I have 46 (I think?) followers, probably 35 of whom I’ve never met in real life. That still weirds me out a bit, that there are 35 people (maybe; if they’re real) in the world who are connected only to my pseudonym and writing voice, and that’s a relationship that sort of exists. Weird. I chuckle to see how many of the comments here are reassurances that we’re real. I’m real, too! And I did come by your blog via Freshly Pressed about a year or so ago, I think; your wit is marvelous, and worth reading each week. That almost-instant feedback has always been one of my favorite things about blogging. You can publish a post and within minutes hear back from someone halfway around the world. There’s no other form of writing that offers that kind of response. But the Likes that arrive within seconds are, I imagine, the result of something that’s been programmed to do it automatically. And that’s pretty empty. Thanks, Christiana. I’m glad you’re real, and that you made the time to read and comment. I appreciate it. We’re all looking for our slice of the audience and the subscriber stats were once a useful measure. It looks as though we’ve lost that. Thanks for the comment. I look forward to hearing from you again. I love your posts: themes, opinions, drawings… We haven’t met “in the flesh”, but to me it seems we are old friends. You write such a “familiar” stories, they are like written for me. Marusia, that’s about the best comment any blogger could ever get. Thank you. I am real, although my kids have questioned it on occasion. I actually read your post on being a non-vegetable eating vegetarian, found it amusing, as well as something we had in common, so I checked out your blog and signed up! I continue to enjoy reading it………and no, I am not a blogger myself, nor do I have any other agenda. 🙂 Some of us really do exist! What do you think about the idea of a cookbook for vegetable-hating vegetarians? I’d never met any others before publishing that post. There seem to be at least twelve of us in the world. Thanks for the comment, Catherine. Do your kids ever tell you to get real? I love the idea of the cookbook, frankly I have a hard time figuring out what to eat…..although my go to meal is peanut butter & jelly. Charles, honestly I’m sorry to have inadvertently misled you. Yet again. There’s no such magic place. What I meant to say was that I created a visits section in my internet favourites. This way I could follow people I like in my own way, and when I had time to do it, and of course comment. This lets me make regular visits (sometimes it’s recipe blogs) without obliging people to return the favour (unless they want to). Being a non-follower sets one free. You didn’t mislead me, Mary. My routine for visiting other blogs is very hit-or-miss, and as in so many other areas of life, I need to get more organized. You reminded me that there are ways to do that. It isn’t that I dislike all vegetables — just the gross ones. But I stopped eating any kind of meat (including chicken and fish) almost twenty-three years ago, so apparently my body doesn’t need the spinach, either. Reblogged this on Longhorn Web Design. My average is hovering around thirty-two new subscribers a day. However, views and visitor stats remain pretty much unchanged. I wonder if this is based in some way on how many subscribers you have already or on how many likes you get in general. Looks like the busier blogs have been hit harder. Just like anything else in life, its about quality not quantity. A great post and I’ll def be following along for the future. Thanks for the kind words, Joe. And you’re right: It isn’t about how many. I may have gotten a little caught up in the numbers for a while, but I’m cured. A few good friends is always better than a thousand acquaintances. In reference to your final line, I’m really here and I relate to every word of this piece. My subscriber stats are a fraction of yours and yet I know not even all of THOSE actually read everything they indicate they “like.” And many read nothing I post, as far as I can tell. Fortunately, I write for me. I post graphics for me. I post recipes and photographs and art prints for me. I put up whatever makes my day feel happier and more peace-filled … and if others enjoy those things, that delights me but my self-esteem is not linked to it. I’d be lying, however (and everyone who writes knows this) if I said it doesn’t matter to me whether anyone reads my stuff or not. It matters. It matters very much if a certain percentage of the signers-on read, enjoy, like, are touched by, remember, share, smile over, laugh at the things I make available. And comments are the icing on the cake — those are the gold nuggets of blogging when they’re well thought out and shared from the heart. Speaking of which, it’s well past time to end this one! Much of what we write is an attempt to connect our mind with the mind of another human being. It takes effort on both ends, but when done with sincerity and compassion, the results can be pretty wonderful. I guess I’d keep writing even if I was sure nobody would ever read it, but it’s nice to know there’s someone there. Your thoughtful comment is proof that there is. Thank you. I read your post and learned something, so thanks! I’m happy with my 52 followers. If all fifty-two actually read your posts, then I think we’re about even. As I said, the number doesn’t mean much. Now you have nine followers (and that’s pretty good for a week). You’re too kind…and you just made my day! Just because a comment isn’t in English doesn’t mean it is not worthy of translating and answering! Foreign language people have an opinion as well you know! I’ve never seen a helpful answer to that last part. It is possible there are people who can read a foreign language (English) better than they can write it (who may even feel insecure about their writing ability in that foreign language). That said, it still poses a conundrum for the blogger, exactly as you say. It does have an auto-identify feature that’s fairly good at recognizing languages. If nothing else, it’s fun to translate English into another language and then back to English. The result is often very amusing. I’ll give that a try, WS. I wasn’t aware of the Detect Language feature. Thanks. Google Translate add on for Chrome means that I can read any comment, from anyone in the World as it auto translates it, also it means I can take the time to read theirs. Sometimes Google gets it wrong but it is not too hard to read between the lines and understand it. The walls that used to section this World and collapsing, now all we need to do is appreciate other peoples religions. I sometimes wonder if achieving space flight may prove to have been a key aid in understanding how artificial political boundaries are. So many astronauts comment about the abiding perception of “one world” when they gaze down from orbit. As the images and videos become better and better, we all get a chance to feel that perception. 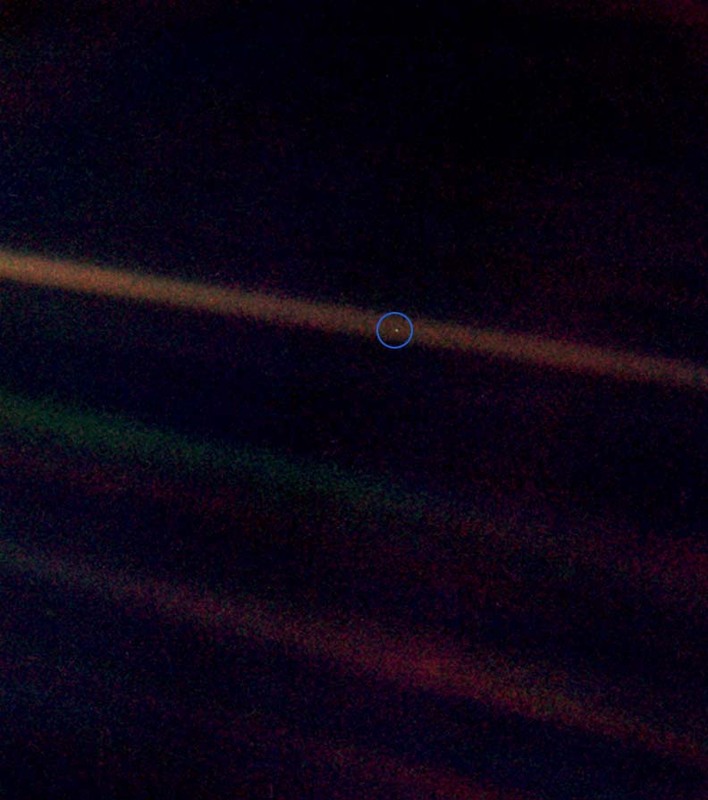 I especially like that “pale blue dot” photo. That’s us. All of us. One bluish pixel representing everyone who is and ever was. Those first images of the world without political boundaries did evoke a lot of hope, WS. But it’s been more than four decades now. Maybe we’re just slow learners. Oh, I think it’s safe to say that we’re very slow learners! but still on this side of the vein. That was a resident winediarist. Body nasty dog shook the previous shiver. And it was on a fairly old post, so there’s little chance of anyone seeing the comment. I really don’t get it. One tactic is to generate text from fragments or from a grammar generator (it’s kind of fun writing something that spits out random gibberish,… but grammatically correct random gibberish). The trick is to get the comment posted… along with the link to their “BUY BUY BUY” page. Using a foreign language might make it even more likely some blogger will just pass the comment without review. Or maybe it’s an important, vital message if we could just figure out what he means…. One of many reasons for this “phenomenon” can be a sort of greed. When you are online, looking at fresh pressed for example, there is a lot of information, a lot of interesting topics or pictures. If you don’t have any special goal in mind, if you are not looking for a specific topic, you may have an instant urge to read anything. That’s why you click on any link, open it, browse it, and then your mind wanders. You think if I am going to read this page, with 10000 words, I may miss 10 pages with 1000 words…. I think you see what I mean. This is one of bad side effects of internet: too much information and little time, results in reading just introductions and gathering shallow knowledge. I think you’re right. Some of it is greed, and some of it is just the tendency to attempt too many things in too little time. This is so relatable! You took the words right out of my mouth. I hate when I write a lengthy post then I get “likes” within seconds. Unless you’re some speed reading champ I doubt you read my post. I’ve also been trying to figure out when I publish a post I get follows with what seems like they haven’t read a single post on my blog to interest them. Not even the About. The number of comments and “likes” vs subscribers never add up. I’ve considering disabling the “like” button and just leaving the comment section, although, maybe that’s not so bad either. Maybe taking those things away will prove effective. Also, I found your blog using the recommended blogs feature and i clicked on humor and yours was one that popped up. Maybe this answers your question. P.S. I hate scrolling all the way down to leave a comment especially when comments are almost 300. The numbers have never added up, and have always been predictably out of whack. But now the whack factor has increased to the point where the stats are pretty much meaningless. There are some real people out there, though, and I’m grateful for that. The comments for this post are high, I think because it hit a nerve. Thanks for reading, and for taking the time to comment. wow, just as I was going thru some recommended blogs and “following” a bunch, for no reason, except to get other people to follow me, as a friend told me I needed to do to get followers. Then I came across your post. Very eye-opening, and interesting. I see people with 13,000 followers, and I read a few of their posts, and they are total crap. I wonder, how did this person get 13k followers? Your blog looks good tho, and I will be back. : ) best.. sherri. I’m not sure if you’re real or not, Sherri. When I clicked on the link to your blog, I got a message that said it’s no longer available. Did you leave this comment, then immediately delete your own blog? When I click on your name, under the gravatar, I get the error message. I think it’s because the word unnecessary is misspelled — the second N is missing. When I copied and pasted the correct address, there you were. Thanks for clearing that up. I’m glad you’re really there. After all this, I just had to drop by and check out your blog. Glad I did! Delightful stories! it’s really difficult to manage finding your writing ‘voice’. But you have that voice and it’s really attractive. That’s one of my reasons I followed you blog. Thank you. That’s a really nice thing to say. i feel your sentiment. i think (ideally) we (writers, photographers,musicians, bloggers in general) are here to share our ideas and feelings with the hope that a kindred soul could relate and would get inspired somehow. It’s pretty overwhelming to get lots of likes and follows but yeah, you’re right. What if they don’t read after all? What if it’s just a matter of publicizing their own blogs. prince2000ful Poems Videos and Photoes. My first thought was what a good idea. Of course we are not writing only for getting comments. Mostly I think for our own sake. And then scrolling and scrolling over all those earlier comments made me really doubt. Did you really thought about what you wrote. Oh it must be a hard work only to be that popular. But anyhow your stories must be interesting,so when I have settled here on this Ether word spot I will take my time to read your prose and your stories. Thanks for being here.. Thanks for the comment. I’ve learned to stop looking at the stats and just appreciate whoever happens to come by. A very interesting post which made me consider why I set up my blog in the first place. Oh and I found you via another blog I follow, and always read, and I’m very glad I took the time. Thanks, Sally. It turns out that there are more people reading this blog than I had imagined. Thanks for letting me know. I’m glad you took the time, too. I have had similar thoughts. 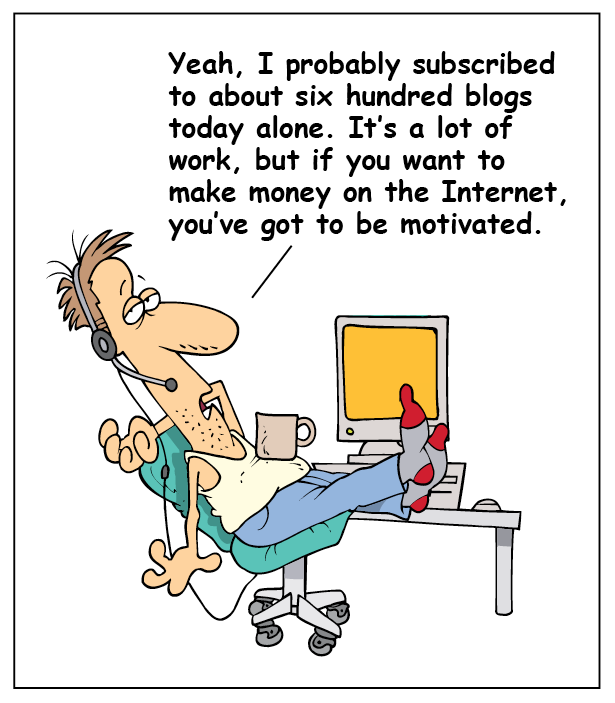 I think there is some truth to the notion that many people subscribe to blogs with some self serving intent. I only started my blog 2 days ago and I have a few followers now and of course out of curiosity I have checked out their blogs – and what is interesting is that mostly (based on what I see there) I have been puzzled as to why these bloggers might subscribe to mine. But of course there is also the other side of subscribing; where one subscribes to a blog because of an interest in the content. Sadly though I suspect this type of subscription is probably in the minority. Anyway – I did enjoy this post so thanks. Minority, yes — most subscribers never read a single post, and (I suspect) never intended to do so. We just have to focus on the ones who do. Good luck with your new blog. This information is extremely helpful to me, someone who is relatively new to blogging, while being relatively old to writing, and, well, relatively old in general. I don’t quite understand all the ins and outs of traffic, pings, meta, and a bunch of other terms floating around here! I don’t understand those terms either, JJ. Apparently, there are pingbacks and trackbacks, but don’t ask me what the difference is. Thanks for the comment, and good luck with your blog. A friend directed me to your post, and I can see why. I just wrote something similar to this and I understand where it stems from lol. It’s amazing how social networks can manage to NOT be social. I actually decided to make most of my post force interaction because I am always interested in who is really reading and who is just “liking” because the option is there and they are too lazy to read. Lately, I’ve been noticing a big drop in the number of spam comments, as well as views. I think WordPress is getting better at filtering them out. As for who is actually reading the posts, that’s a harder question to answer.